Pulp and Paper plants need every advantage available in the marketplace. 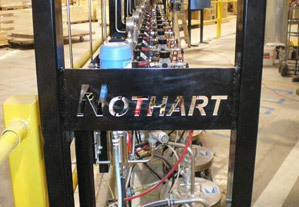 At Nothart, we have the necessary experience in providing high quality, durable pumps, mixers, and blowers that are as efficient as possible. For example, our Heat Exchanges can help your business recapture energy and our Auto Lube systems will prolong maintenance cycles. All of these advantages count, and we at Nothart, invite you to call us to discuss how we can help streamline your Equipment Maintenance Schedule.